This fine antique George V sterling silver photograph frame has a plain square form with a circular internal window. 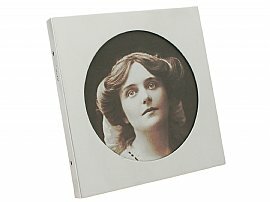 The surface of this antique solid silver photo frame is plain and unembellished. This impressive photo frame has a velvet covered back and hinged strut, secured with three swivel catches; the body and strut of the frame have been recovered in navy blue velvet replicating the same appearance as the original covering. This fine George V piece is fitted with a removable glass panel. This antique photograph frame is a very good gauge of silver, fine quality and in excellent presentation condition. Full hallmarks struck to the surface of the frame show signs of wear but remain legible; the first portion of the makers mark is rubbed. Diameter of internal window 12.2cm/4.8"